The hero of this pictorial romance, and his best friend (the narrator) are to be found on the half-title fishing. 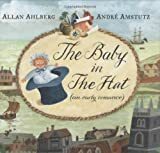 On their way home, past the title-page, they see a baby about to tumble from an upstairs window whom Our Hero catches in his hat. The half-crown reward that follows pays for a trip to London and that eventuates in a sequence of maritime adventures (over all of six double-page spreads) before the Happy Return and Our Hero’s marriage to Guess-Whom. 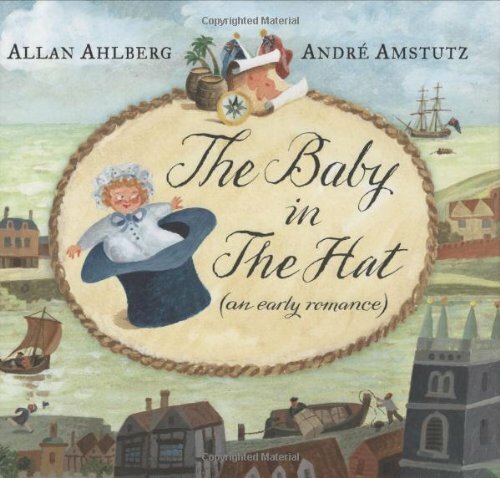 The Romance is told in a near-versified prose, with occasional interjections from sundry birds, mermaids and mariners, all matched in beautifully with André Amstutz’s racy watercolours. There is a cod eighteenth-century air about the tale (not least in its comic colophon and its use of a digitized version of the famous Fell printing types) and the zest of the whole exercise allows one to forgive some fearful anachronisms.